Oakland Christian Church (Disciples of Christ) is composed of members and families from diverse backgrounds—Protestant, Catholic, and Eastern Orthodox. This diversity is consistent with the beliefs of Disciples, because we have no creeds or official doctrinal statements. The Christian Church (Disciples of Christ) was founded in the early 1800s on the American frontier. The founders—Thomas and Alexander Campbell, in Pennsylvania and West Virginia, and Barton Stone in Kentucky—envisioned a united church modeled on the New Testament rather than on creeds and official doctrinal statements. Disciples organize their churches around the biblical idea of covenant, emphasizing not obedience to human authority but accountability to one another because of our shared belief in the Christ. Open Communion. The Lord’s Supper, or Holy Communion, is celebrated in weekly worship. Communion is open to all Christians. 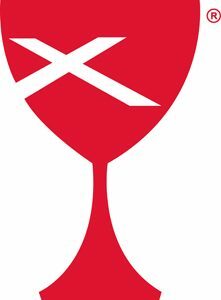 The red Chalice symbolizes the central place of communion in worship, and the white X-shaped cross of the disciple Andrew is a reminder of the ministry of each person and the importance of evangelism. Freedom of Belief. Membership in a Disciples church is based upon a person making the “good confession” that Jesus is the Christ, the Son of God, and that he/she seeks to follow Christ’s example. Disciples have no official creeds; rather, individuals are free to follow their own consciences guided by the Bible, the Holy Spirit, study, and prayer—and are expected to extend that freedom to others. Disciples believe that individuals are able and are encouraged to interact with God, and that it is not necessary for a minister or priest to mediate such interaction. Adult Baptism by Immersion. Although Disciples practice adult baptism by immersion, other forms of Christian baptism are honored if one transfers membership into a Disciples church. The Ministry of All Believers. Disciples affirm the priesthood of all believers, rejoicing in the gifts of the Holy Spirit. Therefore, both ordained ministers and lay persons lead in worship, ministry, and spiritual growth. Congregational Style of Government. Each Disciples congregation is self-governing and calls its own pastor. Worship services may be formal or informal, depending on the wishes of the congregation. Leadership is open to women and men equally. Open discussion of issues is encouraged, and diversity of opinion is respected. Each member has an equal vote in congregational business. Belief in the Oneness of the Church. Disciples believe that all Christians are called to be one in Christ and to find ways to work together in showing God’s love through witness and service. Not surprisingly, then, Disciples have been leaders in local, national, and international ecumenical and interfaith movements.